ENEOS ECO CVT Fluid UNIVERSAL - Pann Auto Performance - San Diego largest aftermarket automotive performance parts - What do you drive? ENEOS ECO CVT FLUID is a fully synthetic continuously variable transmission (CVT) fluid formulated to meet quality requirements for many types of Asian CVTs. ENEOS ECO CVT FLUID can provide superior fuel efficiency, ensure longer drain interval and optimize noise reduction. 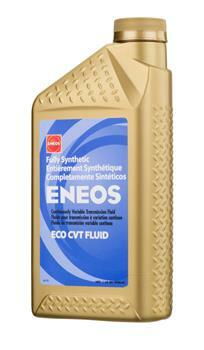 ENEOS ECO CVT FLUID is applicable for both belt and chain pulley types of CVTs. Based on our original Friction Control Technology, which has been developed jointly with Japanese car manufacturers, ENEOS ECO CVT FLUID can optimize friction characteristics to improve power transfer performance. ENEOS ECO CVT FLUID is a fuel efficiency type of continuously variable transmission fluid that fulfills rigorous requirements for fuel efficiency of Japanese car manufacturers. ENEOS ECO CVT FLUID formulation with fully synthetic base oils and carefully selected viscosity index improvers can provide excellent accelerating performance at very low temperatures. Furthermore, thanks to our unique additive technology, ENEOS ECO CVT FLUID can help clean and maintain transmissions to extend life and performance even under high-speed and high temperature driving conditions. Based on our internal test data using CVTs from Japanese auto manufacturers, ENEOS ECO CVT FLUID reduces noise from transmissions by a maximum of 5%* due to selective additives that can be effective for noise reduction. ENEOS ECO CVT FLUID provides more quiet driving. 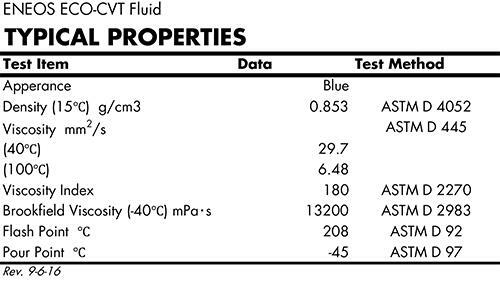 *As compared to our conventional CVT fluid. ENEOS ECO CVT FLUID is used in both belt and chain types of CVTs of a wide variety of Japanese auto manufacturers, and can meet their service fill requirements**. **ENEOS ECO CVT FLUID is not compatible with toroidal and dry types of CVTs. ENEOS ECO CVT FLUID is recommended for continuously variable transmissions in most Asian cars (Toyota, Nissan, Honda, Subaru, Mazda, Mitsubishi, etc.). It can be used for an extensive array of both belt and chain types of CVTs and is compatible with many of the latest CVTs including Nissan NS-3, Toyota FE, Honda HCF-2, Subaru CVTF-II. ENEOS ECO CVT FLUID is not recommended for Toyota Hybrid CVT and Nissan Extroid CVT. Always consult your vehicle owner’s manual for manufacturer recommendations. Eneos products have kept my car running perfectly since I have been running it.